It is known that 3D printing with polymers encourages the recycling of plastics to create recycled plastic filament and application areas of this technology now have no application limits. The plastics dispersed into the environment gives rise to a huge landscaped damage, especially for the “unbreakable” kind of these materials. The knowledge that these materials, available everywhere in our homes (bottle caps, Lego bricks, a bottle of dishwashing liquid) can potentially turn into 3D printing filament with machines like ours Felfil Evo filament extruder, is still uncommon. 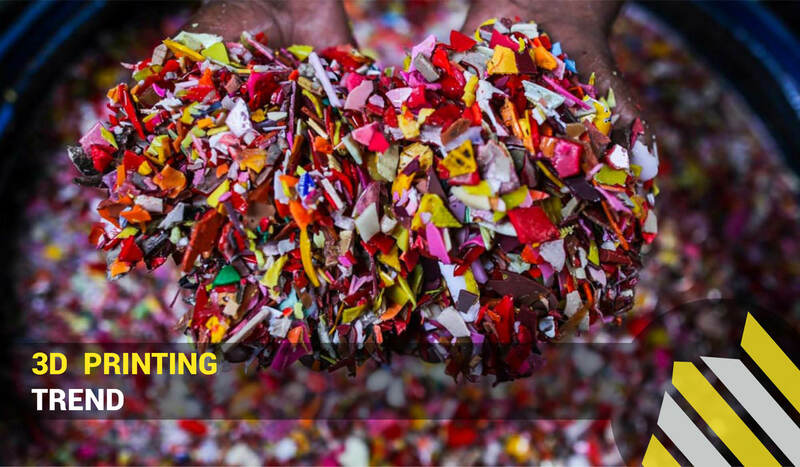 Projects like PreciousPlastic base their philosophy on this concept sensitizing the global population to reuse plastic produced in the domestic context, in order to improve living conditions by cleaning up the environment and create economic value. Other projects bring to light field of action that takes part of prototyping in the medical area; currently explored areas of application of 3D printing include biomedical engineering and orthopedic surgery, otorhinolaryngology and cardiovascular; many studies are now using 3D printer and prototyping to test biomedical implants and exoskeletons that will improve the life of patients considerably. The Santobono Pausilipon Foundation and the Hospital Santobono Pausilipon carry out the first clinical trial in pediatrics of a system that replaces the traditional “plaster” with an ABS plastic exoskeleton printed in 3D. The Doctor Lelio Leoncini deals with orthopedic corsets printed in 3D; in this case, the advantages in the use of the 3D printer would be innumerable, the orthopedic corset it would be very light at a reduced cost and with the ability to recycle the PLA after use. Particularly we are talking about ABS and PLA. The ABS as a polymer can take many forms and can be designed for having many properties. It is a robust plastic with a major flexibility, compared to PLA. The flexibility of ABS allows creating the connecting parts that are easier to work (LEGO bricks are made of ABS). It’s polishable and can be easily machinable. The filaments made of ABS (acrylonitrile butadiene styrene) are used to create rigid and light objects, like Lego bricks, car parts, plumbing pipes, musical instruments like the flute and clarinet. The PLA, instead, it’s created by processing different plant products, including corn, potatoes or sugar beet and is considered a more ‘environmentally friendly’ compared to ABS plastic based on oil. Being transparent, it can be colored, made opaque or glossy, that’s why the PLA filaments can be used even for aesthetic uses, from small household objects to an educational use in schools. It can be also used for food packaging. However, PLA isn’t bio-degradable and it can’t degrade in your garden or in your house. It’s more rigid than ABS and sometimes it’s more difficult to create an accurate fit between two parts. The range of materials is very wide and their experimentation is constantly changing and looking for new fields of application.